Hello, everyone! This post follows up on a conversation I started with Randy Carone, who contributed one of the photographs for a previous blog post about leaving plant seedheads and fruits for winter birds to eat and when which birds eat particular fruits and seeds. 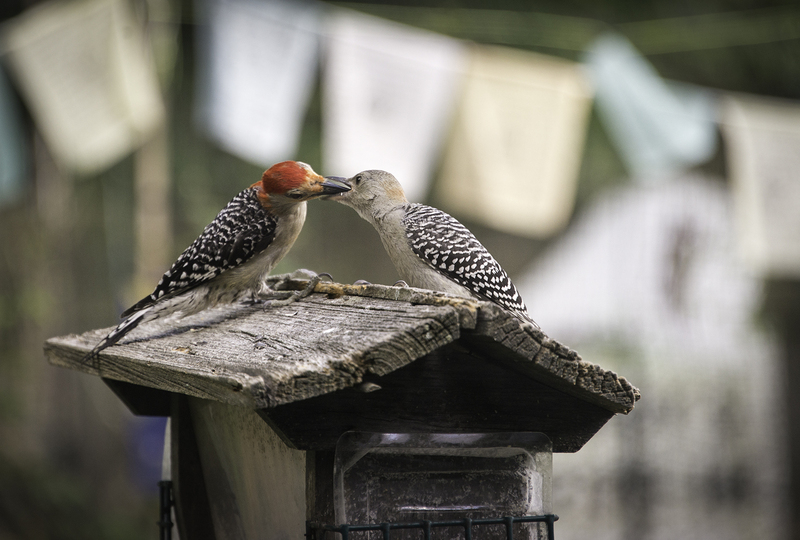 After feeding birds in his backyard for 30 years, Randy now has a seriously addictive bird feeding habit. Randy, who is a photographer first and a birder second, doesn’t count himself a having seen a bird unless he has gotten a photograph of it. In fact, he may end up photographing a bird and not really knowing what he has “seen” until he views the photo, since light conditions make it hard to see with the naked eye. Randy has one pole mounted bird feeder that his daughter Kate bought him a while ago. 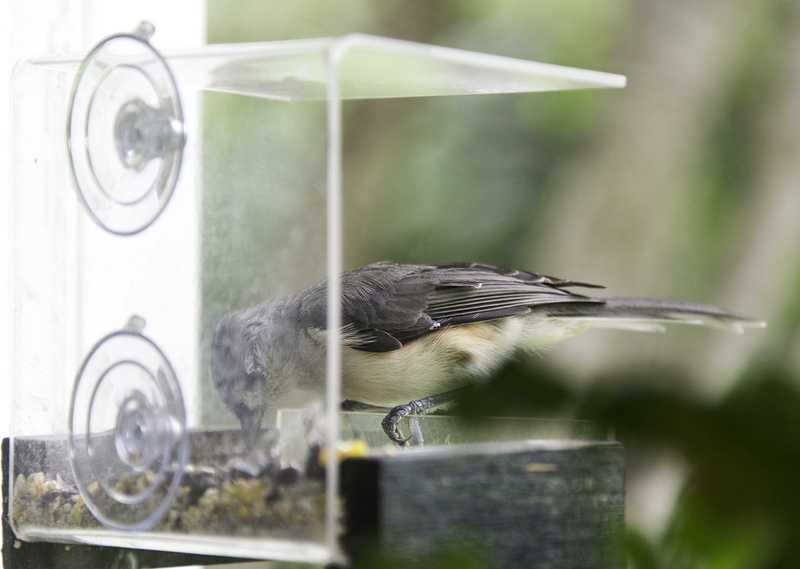 He also has two window mounted feeders—the one in the front acts as “cat TV” for his (and his wife, Emily’s) two cats. 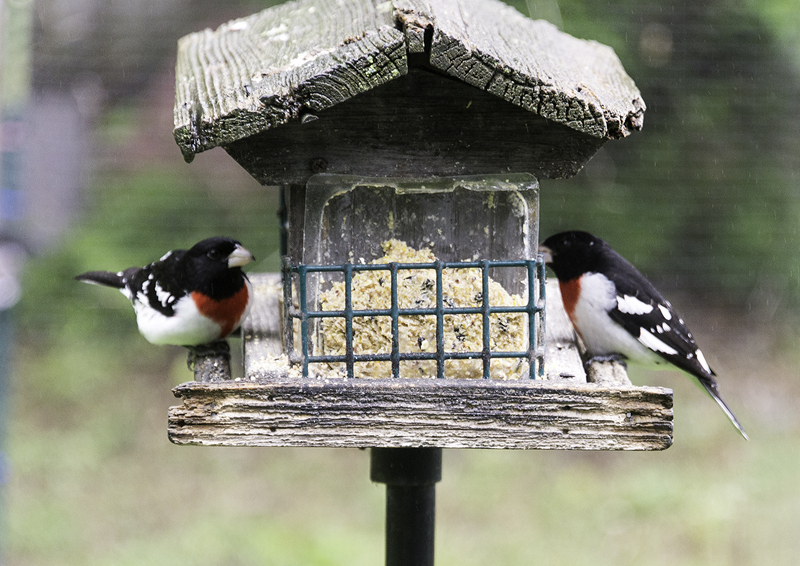 He also has two “finch feeders,” round clear tubes with a roof, hanging from a line. 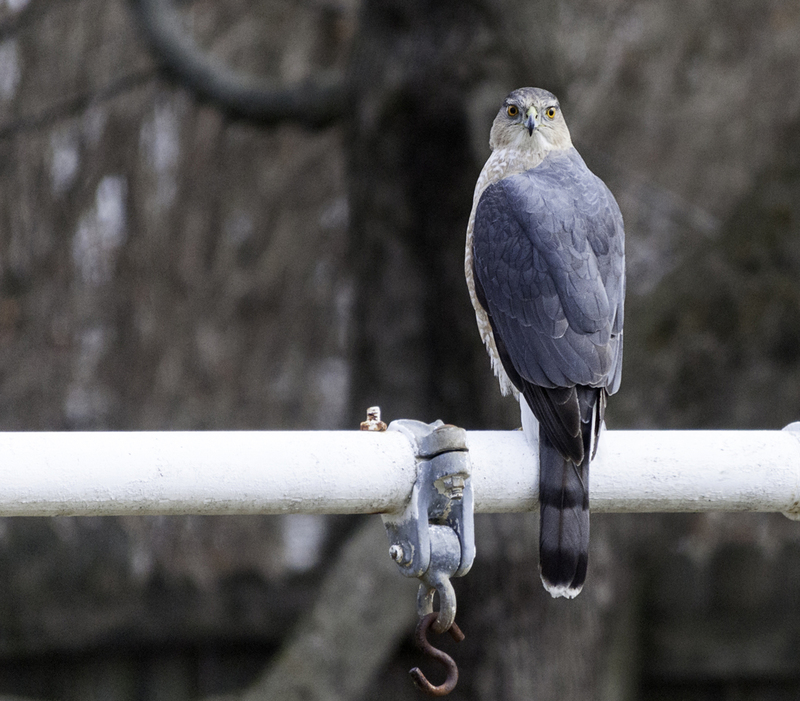 During warmer weather, he also has a hummingbird feeder. 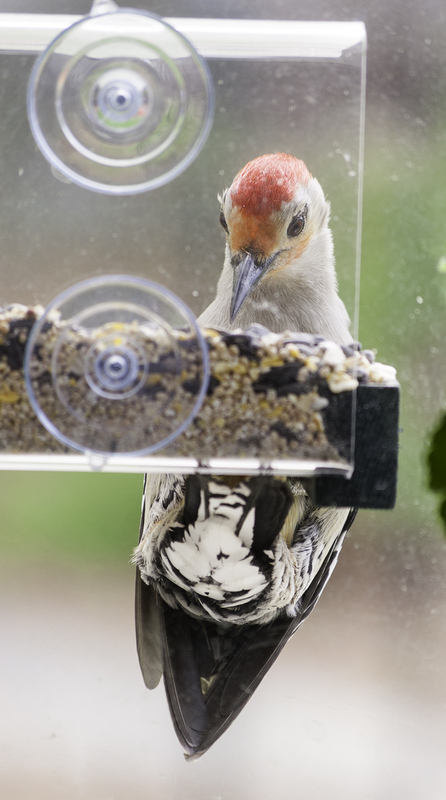 His basic food of choice is Audubon Supreme Blend, which has seeds, fruit, and nuts, and which he buys a 40 pound bag of for about $40 every two weeks. 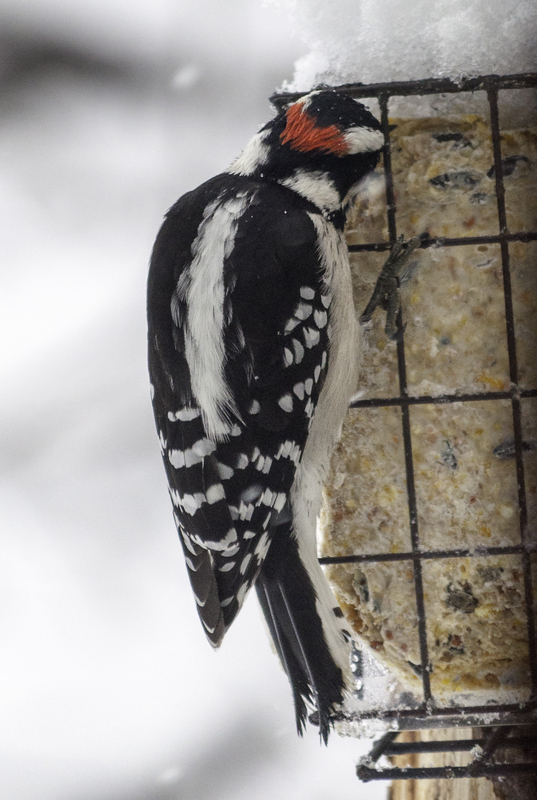 He supplements this with suet on the pole feeder. 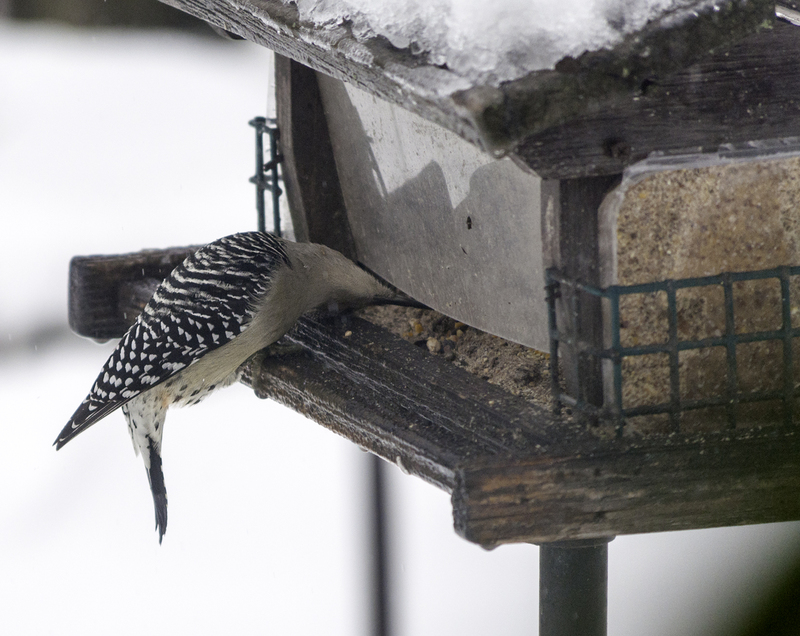 The pole feeder also has a “squirrel catcher” that prevents squirrels from getting to it, although they still get to feed since the birds slop things over the sides of the feeder onto the ground. 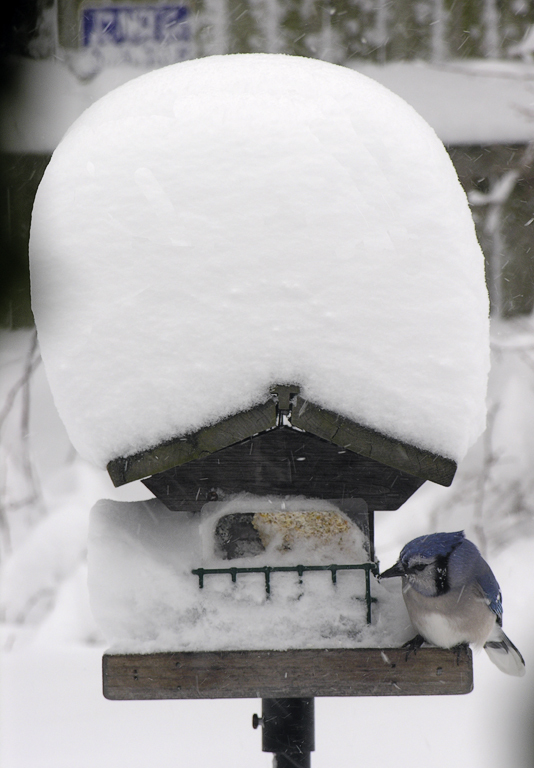 Squirrels –two of them—can and do get to the window feeders, but so do the birds. 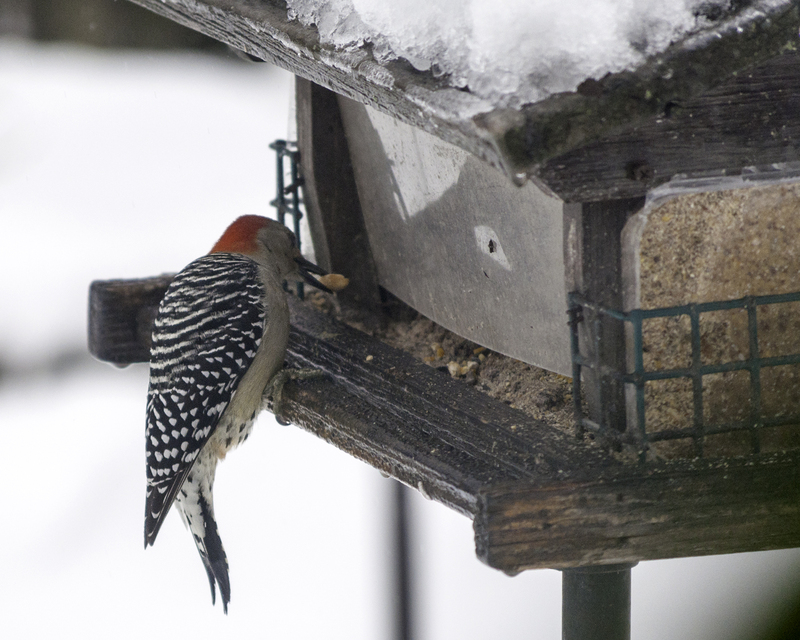 He fills the two finch feeders with Nyger seeds (sometimes called thistle seed, but apparently not actually related to thistle at all). Perhaps the most interesting thing about Randy’s feeding (to me) is that it has given him ample opportunity to intimately observe and learn some bird habits. 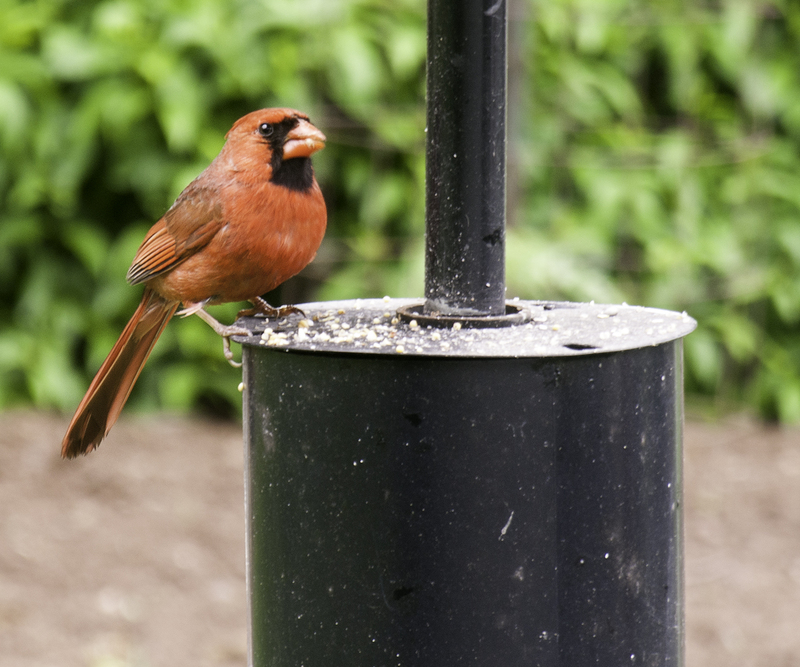 He has noticed that while cardinals stay around and are feeding year round, they generally like to wait until dusk to feed, and like to eat alone or in the company of other finches (since they are also a type of finch). White throated sparrows are only around in the winter, when they migrate south from their summer range for the somewhat warmer weather New Jersey represents for them. 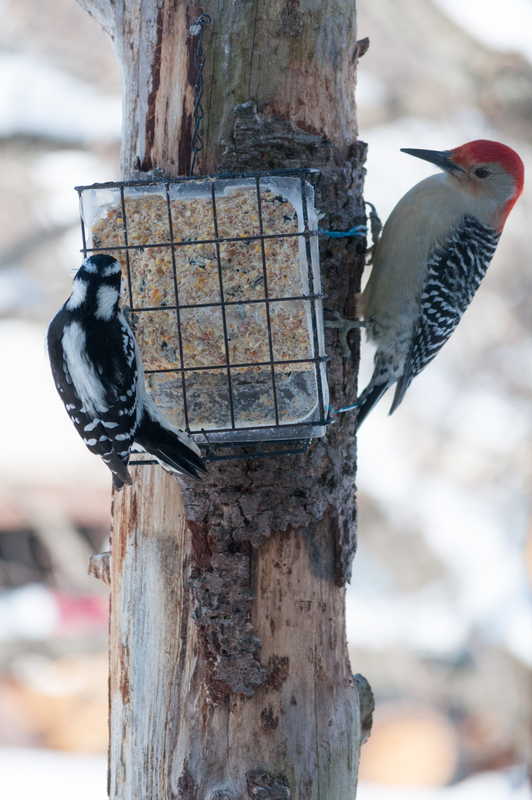 Red-bellied woodpeckers are aggressive, and will peck other birds; blue jays are also aggressive. 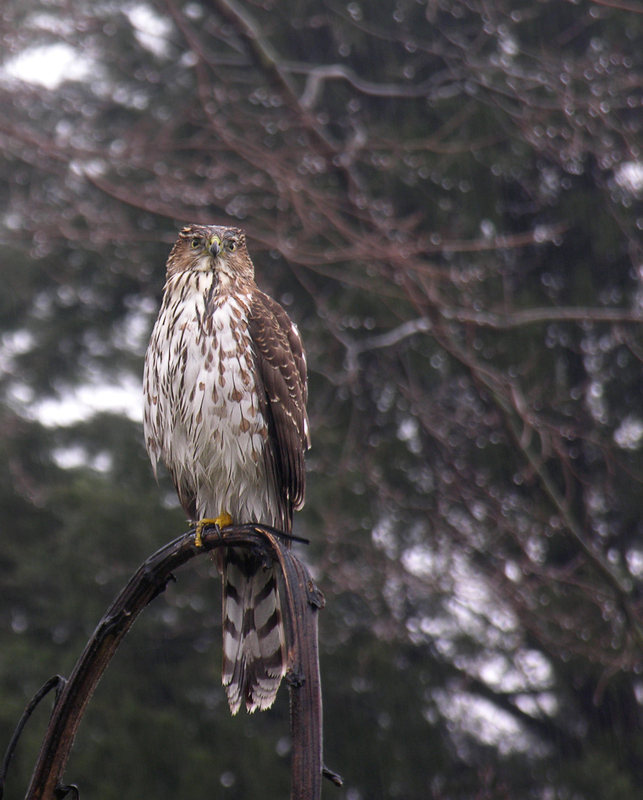 The bird feeders indirectly also feed meat eaters—hawks will sit some distance away, pretending not to notice, but waiting until an unwary smaller bird can be picked off at the feeder in a cloud of falling feathers. Mourning doves, in particular, are “dumb,” as shown by how often they end up being someone else’s meal. 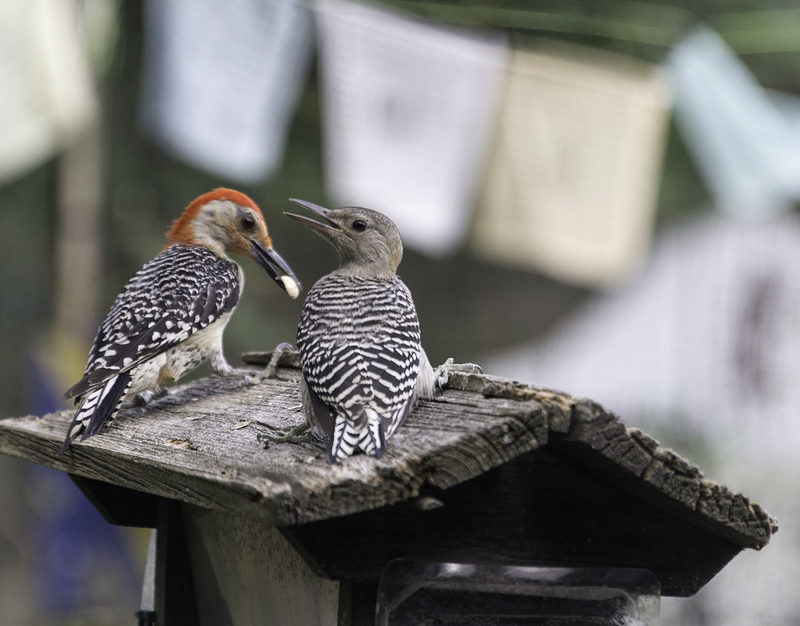 One of Randy’s favorite photo sequences is of a mother Red-bellied woodpecker feeding her almost same size offspring; he feels sure that the juvenile was fully able to feed itself, but the mother still wanted to do so. 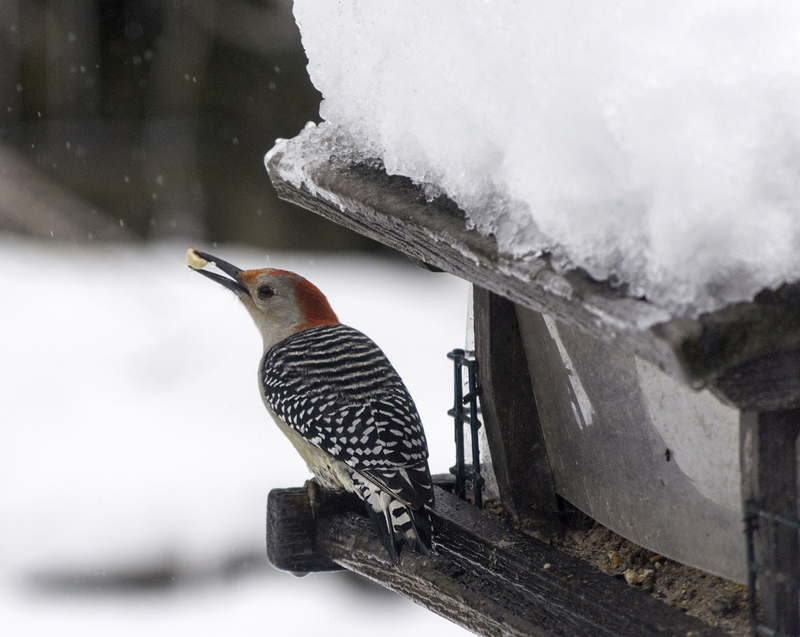 She had picked out a peanut from the mix, used cracks in the roof of the feeder to smash it into smaller pieces, and then carefully picked out and fed the pieces to her child. Randy’s and Emily’s yard includes various trees and shrubs that also provide cover; in particular, finches take refuge in a Blue Spruce tree, and an Azalea bush right by the back porch is also a common source of cover, especially when it leafs out. Randy grows Tithonia, Passion flowers, Sage, Cat Mint and other flowering plants that provide nectar to hummingbirds and seeds for other birds to eat. My school, the John Witherspoon Middle School (JW), has a Memorial Garden tucked into a wonderful small niche in the front of the school. It is a sort of “secret garden,” bounded on one side by a school corridor with a wall of windows. This allows humans a view inside without needing to encroach on the garden’s privacy. This makes it a perfect place to try to create a functional—and visible–ecosystem where plants will feed insects and other animals, where insects will pollinate plants and raise young, where some insects will become food for birds, and where birds and other animals will find shelter, food and water. We had plenty of native plants–I still had part of a donation to the Princeton Schools from Pinelands Nursery, arranged through sponsorship from the Mercer County Soil Conservation District. Mark Eastburn, the Science Teacher from the Riverside School, had native plants through grant funding from the American Society of Plant Biologists (ASPB). Mark’s plants included some carnivorous (insect eating) plants, specifically Venus fly traps, sundews, and pitcher plants. The garden already had some traditional decorative landscape shrubs, including azaleas, crape myrtle and those green bushes that prune so well into geometric shapes but whose names I never learn. We decided to retain the existing shrubs as a layer in a multi-layer landscape. Under and around the shrubs we would add the herbaceous native plants including sedges, monarda, goldenrod, columbines, and many others to provide shelter to flowers and animals as well as soil health promoting ground cover. The whole project was a team effort not only by Mark and myself, but of the whole Princeton school community. A lot of the effort was enthusiastically provided by students from Nyrie Janho’s Food Science and Wellness Classes, and by the school’s two Robotics Club teams, the JW Hornets and the Techno Tigers. Students helped clear the English ivy and other invasive weeds that were overrunning the garden. Mr. Eastburn and his students sunk five tubs into the ground for the carnivorous plants; the tubs will be watered only by rain water, which will help the plants retain the moisture they require to thrive. Both of the Robotics Club teams are preparing for a competition that requires them to not only build Lego robots but to plan and carry out a community service program. The Techno Tigers, whose project involves encouraging birds to take up residence at JW, raised funds for a bird house and bird bath. The JW Hornets are working on a project to help bees, which are increasingly endangered in the modern American landscape, and will be adding elements to the garden for this purpose. Compost and mulch were supplied by Princeton Public Schools Grounds Foreman Tony Diaforl and his crew from the ecological facility that Princeton shares with Lawrence Township. We applied the compost as an initial top dressing to supply organic matter and some nutrients from the surface down, just as it happens in natural systems. The top dressing of compost will work with the mulch to discourage weed seeds from growing by denying them the sunlight that they require to germinate. We mixed the donated mulch with leaves collected from the school lawns for the second layer over the compost. This combined mulch layer will provide not only protection for the soil, reducing oxidation of carbon and soil nutrients, but cover for small critters including insects. John Witherspoon Middle School Teacher Kelly Riely has arranged for some of the members of her Do Something Club to water the new native plants once a week until it gets colder. The project could not have been done without the support of Princeton Public School District personnel, including Science Supervisor Edward Cohen and John Witherspoon Middle School Principal Jason Burr. The garden is still very much a work in progress, as we wait to see both how well our new introduced communities of plants and the ones already there function together. In the spring, we will add additional plants to fill any holes and to replace any plants that don’t make it. We will continue to recruit members of the JW and the larger Princeton communities to help with maintenance as a form of stewarding some of the ground that stewards us. 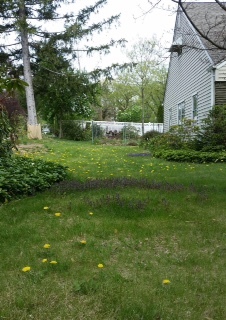 Like many fairly new suburban neighborhoods, my neighborhood has broad stretches of lawns punctuated by landscape beds with shrubs (including those curlicue ones) and a few annual flowers surrounded by expanses of mulch or stones. My beds are increasingly filled wall to wall with mingled native plants and flowers (as well as a few shrubs), leaving me with less and less open mulch every day. And, as noted in the last post, I am leaving more and more browning stems and seedheads on my plants. So, I have already signed up for two programs that provide explanatory signs for my native plants/wildlife habitat enhancing landscape. I was going to write one blog post outlining some of the best of the sign-providing programs, but it immediately became clear that they offer very different things and that the signs are really just a small part of what you can get out of participation in each program. So, this will be the first of a series of posts on sign programs, starting with the program of the National Wildlife Federation (NWF), which has the sign I have seen most often designating a certified wildlife habitat. NWF certification and a sign depend on your answers in five areas the organizations deems critical to providing wildlife habitat. Before you launch right into the registration (and what I consider a rather expensive payment for your sign), you should read over the tutorials for each of the five areas. Doing so can not only give you ideas on easy ideas for enhancing wildlife habitat, but will underscore what practices you are already taking to help wildlife. FOOD SOURCES: You need to be able to certify that you provide three types of food sources, not just three food sources. The list of possible choices includes, first, food sources from things you are growing in your yard (which NWF prefers to be native plants): seeds from a plant (see my last post, for ideas), berries, nectar, leaves or twigs, nuts, fruits, sap, and pollen. Providing insects for consumption by birds or by other insects is mentioned several times, although not specifically on the tutorial’s primary list. 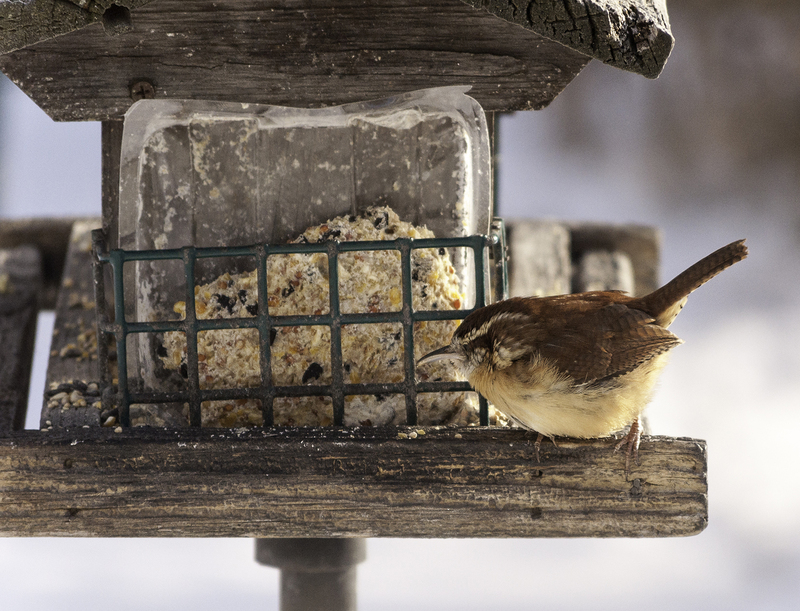 Other acceptable types of food sources are bird feeders, squirrel feeders, hummingbird feeders and butterfly feeders. While the website describes the last four as “supplemental,” and indicates that such food sources can be particularly helpful in the winter, there is no apparent requirement that any of your food source types must be the plant derived ones. 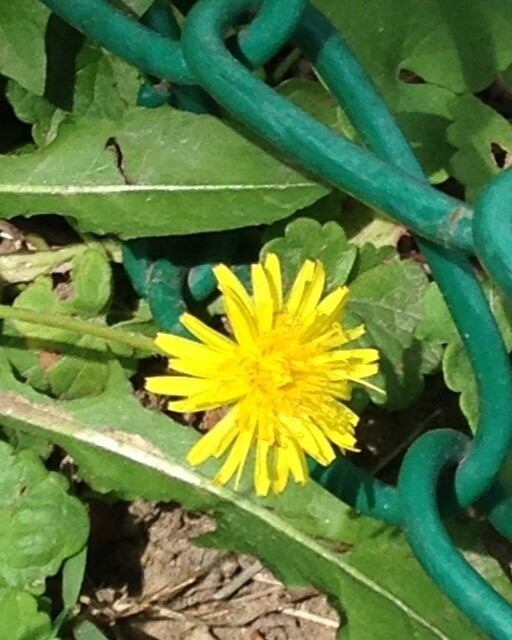 See http://www.nwf.org/Garden-For-Wildlife/Food.aspx. WATER SOURCES: You need at least one water source on or adjacent to your property. I was thinking of my little birdbath as I made this certification. It is true that you can create a birdbath quickly using a shallow dish of water, but a look at the NWF page specifically on birdbaths will help you understand that you can’t just put anything out and be finished. You need to add a layer of stones for small birds to stand on when in the bath if the birdbath is too deep. 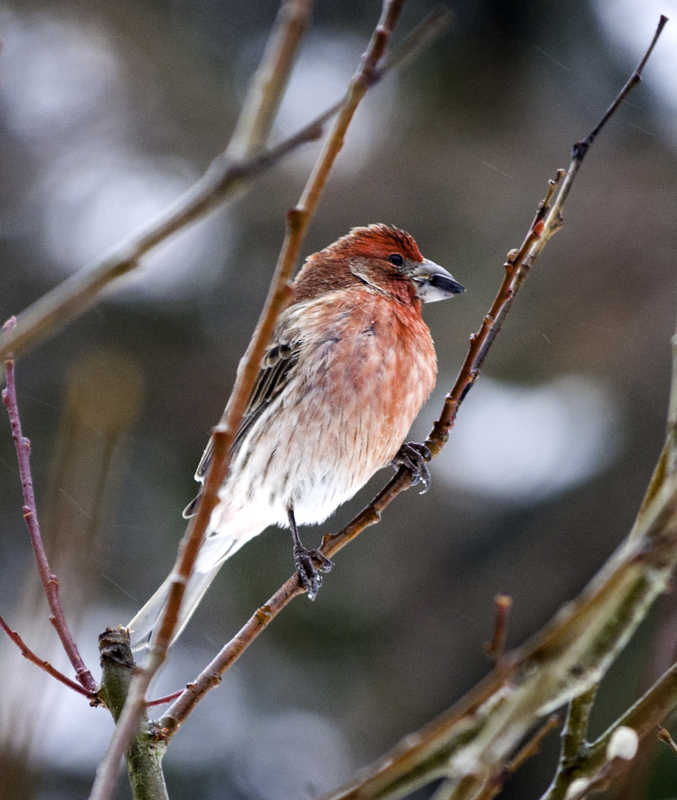 During winter your birdbath may freeze, making it useless—see http://www.nwf.org/Garden-For-Wildlife/Water/Bird-Bath.aspx for all sorts of considerations that go with a bird bath. Acceptable water sources need not be right on your property—bodies of water such as rivers or bays visible from your property can be used for certification purposes. NWF especially encourages people with larger properties to consider putting in a rain garden or backyard marsh, and provides special pages to help you with either of those. See http://www.nwf.org/Garden-For-Wildlife/Water.aspx for more information, and links to descriptions of specific water sources. SOURCES OF COVER: Did you grow up with the image of birds sheltering each night in a nest, as I did? Imagine my shock to learn—rather recently—that birds only build and use nests while they are laying eggs and raising young. The rest of the year, many birds just hang out, day or night, in a place that provides cover. They apparently don’t necessarily have settled “homes” like humans do, and may not even hang out with the birds that they share offspring with. Other animals may use “homes” such as burrows or holes in trees for more of the year, but perhaps the chief sheltering need animals have, aside from raising young, is for cover–places to hide from predators, and places to shelter from weather. NWF requires a certified wildlife habitat to have at least two sources of cover, with acceptable options including wooded areas, bramble patches, ground cover, rock piles/walls, caves, roosting boxes, dense shrubs/thickets, evergreens, brush/log piles, burrow, meadows/prairies, water gardens/ponds and even dead trees with tree cavities. Cover is an area where a little reading can go a long way in opening up your understanding of the natural world. See http://www.nwf.org/Garden-For-Wildlife/Cover.aspx, and the several links included there. PLACES TO RAISE YOUNG: So now that we’ve established that birds only hang out in nests when they are laying eggs and raising young, we can consider the NWF certification category for places to raise young, which recognizes the fact that animals cannot survive long term if they cannot successfully raise a next generation of their own kind. Raising young, as with cover, requires shelter; options you can offer to wildlife for NWF certification include mature trees, meadow or prairie, nesting box, wetlands, caves, host plant for caterpillars, dead trees or snags, dense shrubs or a thicket, water gardens/ponds, and burrows. Actually, the main write up on this aspect of wildlife habitat, found at http://www.nwf.org/garden-for-wildlife/young.aspx, notes that animals may not simply have baby needs and adult needs for shelter/cover, but varying needs at different stages of their lives—think human teenage or young adulthood needs. SUSTAINABLE PRACTICES: The last NWF requirement is that you be using two sustainable practices. This is the one where reading the tutorial at http://www.nwf.org/Garden-For-Wildlife/Sustainability.aspx, and clicking on links there is most useful. The listed areas of sustainable practices are soil and water conservation, controlling exotic species, and organic practices (including eliminating chemical pesticides and composting). Each of these areas has several sub-options. You are probably already doing two things—however, reading the tutorial can suggest even more.